Finally! Today I put the first Caney Fork trip of 2009 in the books. I taught my morning classes and finally got away around noon. Shortly after the generators were turned off at 1:00 pm, I arrived at the parking area below Center Hill Dam. My reel had the spool of line I use when ripping streamers so I put the other spare spool with my "standard" line in my pocket and tied on a streamer to see what would happen. I've been hoping for a shad kill soon and decided on a white Simi Seal Streamer. 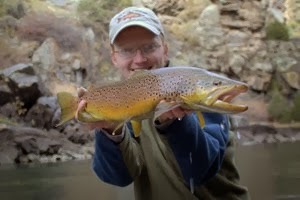 After wandering down the river for awhile, I finally got in and started chucking my streamer. It can't exactly be called casting but it was still effective. On about the 5th cast, a fish nailed it and after a brief fight, I landed my first Caney Fork fish of 2009, a chunky rainbow. "Great!" I thought, "The fish are killing streamers." 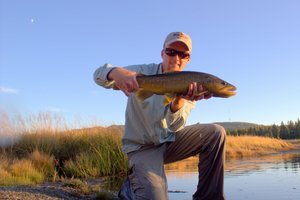 Excited at the prospect of getting into some decent fish, I kept ripping my streamer but with no further action for about 20 minutes. Eventually I got one more but it wasn't quite as fast paced as I was hoping. 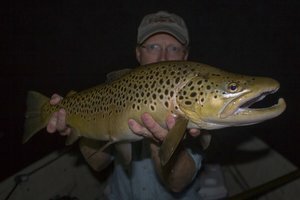 By this time I was really cold and waded over to shore to pull out the other spool and rig up with a deep nymph setup. 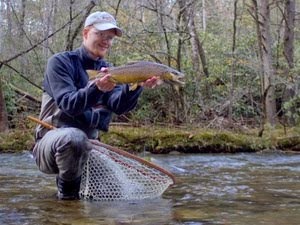 With numb fingers, the normally quick operation took closer to 15 minutes but upon reentering the river, I had on the deadly combo of a copper john and a zebra midge. 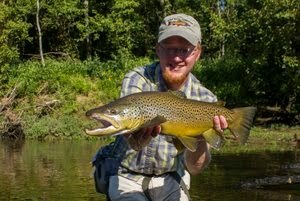 Within a few short casts I had a fish on, and this turned out to be one of the prettier rainbows of the trip. Then it happened, the mother of all wind knots. Funny how these happen only on the coldest, nastiest trips of the year when your fingers don't want to work. I decided to take off the flies and see if this would speed up the process at all. Almost immediately, the knot worked out except for the tippet which I had to retie. After this annoying task was over, I was back into the fish. This continued for the rest of the day, ending the last 45 minutes before the evening generation with me stalking midging fish with a dry/dropper just below the dam. Great looking fish David...The 2nd picture of the 'bow looks like a steelhead...He's got the chrome colored lateral line..cool stuff. I will have to meet you over there soon. Are you carrying your Canon with you on the water? Those pics are wonderful. Going to Yellowstone Next Summer?